Becoming a recent fan (addict) of the television show Lost, I decided "Hey what's the harm in playing the numbers from Lost?" I never came close on my ticket, but I guess that is a good thing or I would have to share the prize with countless other Lost fans. Everyone knows that Hurley won the lottery (and inherited quite a streak of bad luck) by using the numbers 4, 8, 15, 16, 23, and 42, numbers which have since popped up quite often on the show. The numbers have become so popular that usage of that specific number combination has surged in lotteries around the USA and possibly the world. However, unluckily (or luckily if you believe in the power of the numbers), the numbers have yet to prove to be a winning combination. Until November 19, 2005. 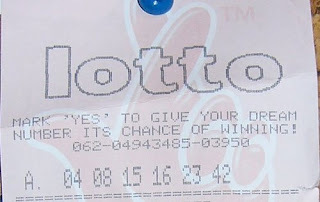 At the Irish National Lottery, the winning numbers for November 19 were 4, 8, 15, 16, 23, and 24 (Bonus: 19). Notice anything about the numbers? Yes, the first five are exactly the same as the Lost numbers, and the sixth - 24 - is 42 reversed. The official website for the Irish National Lottery indicates that 298 people matched 5 of the numbers correctly (and one reader reports that it's 4 times the average number of Match 5 winners). One wonders how many of these winners plugged in 4, 8, 15, 16, and 23. For more information, check out The Irish National Lottery. I guess it's back to quick picks for me.